In this case there is an image displayed on the form. Users can either click on the image to open the traditional file open dialog for selection files or they can drag files from explorer and drop them on the image. Once selected a list of files is displayed below the image. Create a new ASP.NET web application and add a new web form to it. Drag and drop a File Upload server control on it and set its AllowMultiple property to True. 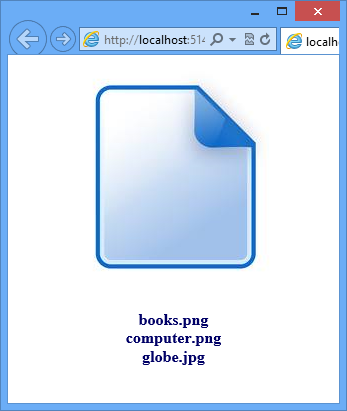 This way you can select multiple files (a feature of HTML5) simultaneously. Then also place an ImageButton control on the web form and set its ImageUrl property to some image file. Then create Scripts folder in the project and place jQuery library in it. You will be using jQuery for some client side scripting. Finally, place a Label control below the ImageButton. This Label will display a list of files selected by the end user. The ready() handler function hides the file upload control from the user. You need to hide it from the client side script and not by setting its Visible property to false because in the later case the control itself won't be rendered in the browser. Once the file upload control is hidden click event handler for the click event of ImageButton1 is wired. Inside the click event handler click event of the file upload control is triggered by calling click() method. This causes the file upload control to display the file selection dialog. The selected files can be accessed using the files property of FileUpload1 DOM element. Notice how the raw DOM element is accessed using $("#FileUpload1") syntax. Then a for loop iterates through the files collection and displays file names in the label. The files collection is FileList object that contains zero or more objects of type File. The name property of the File object returns the file name. To prevent the form submission preventDefault() method is called on the event object. To support drag and drop file selection three event handlers - dragenter, dragover and drop - are wired to the ImageButton1. The drop event handler retrieves the dataTransfer object - the object through which data is transferred during drag and drop operations. Notice the use of originalEvent property to access dataTransfer. The files property of dataTransfer returns a FileList of files dropped by the user. A for loop then iterates through the FileList and displays the filenames.